STRETCh - Gifted Education: Parent Advocacy Model - Are my child's needs being met? Are we ready to embark upon the journey? Are parents ready to accept their role? Are teachers ready to hear what is needed? As a parent, I know that a differentiated classroom is where my child will be most successful. If I am allowed to work with the teacher and help guide meaningful experiences, then we can all hold her accountable for growth. If she is not engaged or bored...I don't want to hear..."She just needs to do her work...If only she turned in her homework...If she just payed attention." If she is unengaged...there is a reason. Let's figure it out together and keep her moving forward. It might mean that the teacher needs to change her instruction in order to capture her engagement... and that's okay. As a teacher, I know how overwhelming it can be to meet all the students' needs. I will never forget Pat (if you are out there Pat...let me know how you are doing)! He was a seventh grader in my language arts class who "hated" to write anything. After getting to know him and giving up some control of MY content...I asked him what he wanted to write about. He was a huge Metallic Fan and wanted to write about the band. I went home that night and created a plan to infuse my content into the course of his interest. Viola - he ended up writing a great paper on the band and learned through the process...WE BOTH DID! Differentiating in my classroom means engaging all students in the learning process...whatever their starting point...and holding everyone accountable for growth. At times that has meant I had to trust the student and parents and let them have the driver's seat. It is during these times that I have had to learn how to coach from the sidelines...and that is okay! Just because a student doesn't qualify for "gifted and talented" services, doesn't mean that we ARE meeting their needs. Some students don't test well... and that is okay. Some students test great, but aren't interested in the pull-out reading group's project...and that is okay. Some students have a lot on their plate (sports, service projects) and want to pull back a little in other areas...and that is okay. Together...with parents...and student input...we have to help them figure out what is okay...and continually grow in their learning! Just read your flow chart, and it's a wonderful overview of how one can assess a child's needs. It's remarkable that you are able to implement differentiated instruction. I think that's quite a task for any teacher. In your district model above, which measurements are used to progress-monitor your students? At which frequency? 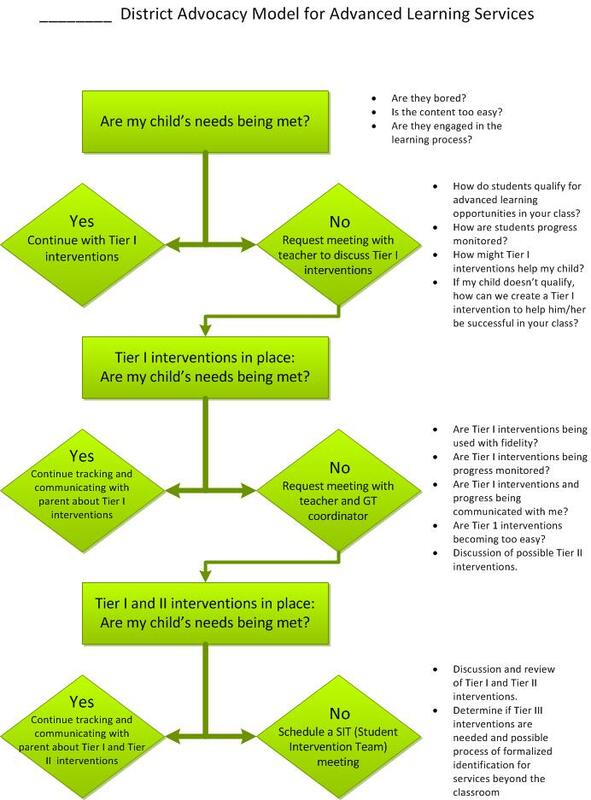 I am curious about what your district defines as Tier 2 intervention? Tier 2 interventions are those that teachers decide and implement within their classroom. Most Tier 2 interventions happen during small group guided instruction.